"For most people Alaska is the dream camping destination. No wonder! for sightseeing or for fishing, is bound to be the trip of a lifetime." Exploring Alaska in an RV has always seemed like the ultimate road trip to me. This is the first time either of us has been to Alaska. Most of the territory we will traverse to get there through Alberta, British Columbia, and the Yukon Territory will be new to us, too. How exciting is that?? We love to explore new places. One of my favorite travel quotes says, "Too often we are so preoccupied with the destination, we forget the journey." I don't know who said that first. I do know that our journey to Alaska is our destination. We hope to make every bit of it memorable and we plan to share it with you on this site. Brace yourself for lots of superlatives in my journaling and spectacular scenery in the photos. I'll do my best to keep this journal more current as we travel this summer. There will be times when we don't have a phone, MiFi, or WiFi connection or I'll be too busy to finish an entry. When I get behind just scroll down through the topics page to see where we are. Note: this is probably the only entry I've written in nine years that has none of our photos. That's because we haven't been to Alaska yet! I'll make it up to you soon. The two images included are from other websites. This is not the best year to visit Alaska. Gas and diesel prices are near historical highs in the Lower 48 and will be even higher in Canada and Alaska. In addition, parts of south central Alaska where we want to spend the most time got record-breaking amounts of snow during the winter. Lousy timing, eh? But my answer to "Why now?" is "Why not?" I've been collecting magazine and newspaper articles about Alaska since the mid-1970s -- and I still have some of them with me in the camper right now! Exploring the 49th state has been on my radar for a long time. Before this year, however, the timing just wasn't right for either Jim or me to visit Alaska the way we want to do it -- slowly and as thoroughly as we can in two to three months, plus some time in Canada on the way there and back. Neither of us could do that when we were working. Even after we both retired, we were so involved in running ultra-distance foot races that we didn't want to miss four to five months' worth of events to travel to the far north. Now that Jim and I are no longer running races we don't have to schedule our extended RV trips around those events. Except for the responsibility of still owning a house, we are free to travel as far and as long as we want. Now an Alaskan adventure is reality! I also mentioned another consideration in one of my introductory entries this year -- life's unpredictability. You just never know what may happen to prevent you from doing the things you've always wanted to do but kept putting off for various reasons. Cancer, Alzheimer's, and other serious physical afflictions happen. So do tragic accidents. My mother always wanted to visit Alaska but she never got there. I'm sure she had other dreams that weren't realized, too. I'm trying to prevent that in my own life. Exploring Alaska is one of the remaining biggies on my life's "bucket list." I don't want to miss this opportunity. Jim and I are not getting any younger. Neither is our truck. So, as I mentioned in an earlier entry, come hell or high water from all that melting snow, we're going to Alaska this summer. Alaska is huge. So is the distance from Montana, Idaho, or Oregon through Canada to get there and back on a road trip. Even if we spend two or three entire months in the state of Alaska we will barely scratch the surface of all the things there are to do and see. That has become very clear as we've researched this trip. Thank goodness for the internet -- it is so easy to find useful information. It's also a bit overwhelming because we'll be traveling through so many interesting places. We've read several relevant, detailed online journals and blogs written by other retired RVers who have spent several weeks to several months in Alaska. Those have been very informative and have helped us narrow down the places that will probably interest us the most. In addition to websites that are specific to areas we want to visit, like Denali National Park and the Kenai Peninsula, we have found other very useful online resources such as U.S. and Canadian weather sites, travel and road conditions sites, and local news sites. We've obsessed over official U.S. and Canadian customs websites so we have the proper paperwork for ourselves and Cody-pup. We pretty well know what items, in what quantity, we can and can't take across those borders but still hope no one wants to thoroughly search our camper at any of our border crossings -- not because they might confiscate something but because of the time and hassle. The two most useful books that RVers who've been to Alaska have recommended are the Alaskan Camping book mentioned above and The Milepost, a detailed highway log of major routes and side trips through Alberta, British Columbia, Northwest Territories, Yukon Territory, and Alaska. Both books are updated annually. We purchased ours when they came out in the spring of 2011 so we'd have more time to peruse them. They are recent enough that the information should still be relevant this year, although some places may cost more or be closed now. Another useful source of information about traveling to Alaska has been the RVers we've met in the last couple of years, especially snowbirds we got to know at Imperial Dam LTVA in southern California and Davis-Monthan AFB in Tucson, AZ this past winter. Many of them have spent one or more summers in Alaska and were happy to share travel information. One of the things we've read and heard over and over is that once a person has visited Alaska, (s)he wants to go back again. It's difficult to see everything in one trip, even an extended one, and folks just love the place so much they want to return. I'm guessing that will happen with us, too. Having all this information at our disposal is great in most regards but sometimes it is overwhelming when we look at the Big Picture. There are so many routes, so many places we want to see, so many unknowns. Exciting, yes. A little scary, too! This trip will be as fluid as our winter trip was. The only reservations we have made anywhere are at two Denali National Park campgrounds in August. We got online in December when reservations opened for the 2012 season so we'd be sure to have a campsite there. If I had time to visit only one place in Alaska it would be Denali. Enough other people also want to go there that the campgrounds fill up quickly. We're wide open for the rest of the trip. We hope we can get into military campgrounds for a few days whenever we reach Fairbanks, Anchorage, Seward, and Valdez but that's the extent of our planning for specific campgrounds. One reason is that we hope to find some boon-docking (no hook-up) sites along the way. Those are often serendipitous discoveries the first time we've found them. Even if we know where they are, we can't make reservations. We also want to be free to change our minds as we go. We want to travel at a leisurely pace, especially when we get to Alaska. We'll learn about things from other people or we'll read something that might send us off on a side trip or even a different route entirely. We might find a lovely place with lots of things to do and want to stay several days instead of just passing through. If we don't have reservations on the road ahead, we can do that. Conversely, if we think we might want to spend several days in a particular place that sounds great but the weather is crappy when we're there or we don't like the camping options, we can move on sooner if we don't have reservations. Of course, this MO may backfire sometimes. We may not find as many boon-docking or inexpensive public camping places as we hope to find, or they may be full, especially around the 4th of July and Labor Day holidays. 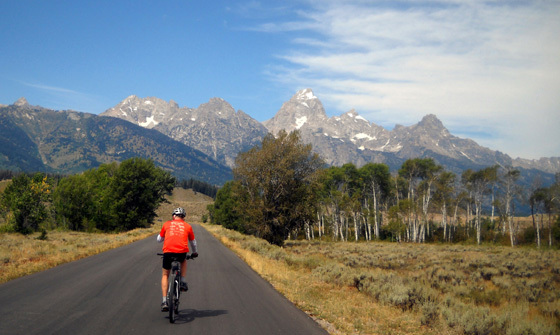 Sometimes the only option may be an expensive private campground -- and it may be full, especially if we find ourselves on a similar itinerary as an RV caravan going to Alaska. 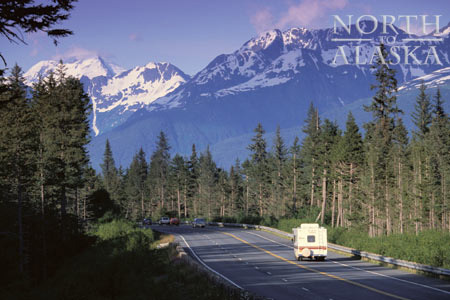 Caravans to Alaska are popular and a group of 20-30 RVs can fill up a campground pretty quickly. We'll have to be plenty flexible. Our original plan -- conceived in January -- was to cross the Canadian border from Montana in late May and travel through Calgary and Edmonton, Alberta (AB) to the Alaska Highway through northeastern British Columbia (BC) and southwestern Yukon Territory (YT) to Alaska. We thought we'd travel rather quickly through Canada in order to spend as much time in Alaska as possible since it's so far to drive, so expensive to get there, and this might be our only opportunity to tour the state. We figured we could spend more time in Canada on the way back to the Lower 48 in September. If there wasn't time, we could always go back to places like Banff and Jasper National Parks and Lake Louise another summer, since they aren't as far away. By now it is clear that the south central part of Alaska, where we'd like to spend the most time, was totally inundated with winter and spring snow. 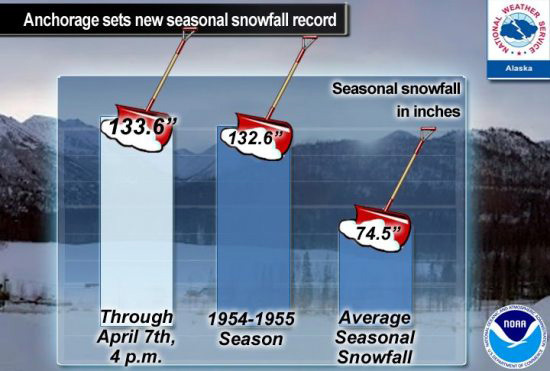 Anchorage, e.g., set a record this past season and high passes still have many feet of snow. Instead of hiking over the Memorial Day weekend, folks will likely be skiing! So we've changed our plans a bit to allow time for most of that snow to melt. It doesn't appear that the Canadian Rockies got more snow than normal. Friends from Whitehorse, YT that we met at Imperial Dam this winter went back home at the end of April and said the major roads were already clear through BC and YT. Our current plan is to stay at the USAF Academy campground in Colorado Springs, CO for a couple of weeks, then head to Malmstrom AFB in Great Falls, MT for a few days. Both are sort of "staging areas" for the rest of our journey. west on AB 43 and BC 2 to Dawson Creek, British Columbia and the beginning of the famed Alaska Hwy. Alaska Hwy. north and west through Fort St. John, Fort Nelson, and Muncho Lake, British Columbia, Watson Lake, Teslin, Whitehorse, Haines Jct., and Destruction Bay, Yukon Territory to Tok, Alaska. We'll have to keep checking on snow conditions in Alaska on the way through Canada. Although the major roads will be open we want to make sure the weather has warmed up sufficiently in the southern part of the state before we go there. At Tok we'll have a big decision to make -- 1) continue northwest to Fairbanks in the interior, where it's likely to be warmer, and do somewhat of a CCW loop of the state or 2) (our preference) head south to Valdez, Anchorage, Seward, Homer, and the rest of the Kenai Peninsula first, then go in a clockwise direction to Denali NP, Fairbanks, and back to Tok. If you look at a map of Alaska you can see what looks like a small area of Alaska that we want to visit. Looks are deceiving, however. Alaska is a humongous state and that "small area" entails a lot of driving. I haven't even added up those miles, nor some side trips we'd like to make. From Haines Jct., YT we might go out-and-back to Haines, AK. From Whitehorse, YT we might go out-and-back to Skagway, AK. From Watson Lake, BC we might head south on the Cassiar and Yellowhead Highways to scenic Hyder, AK, then Smithers and Prince George, BC. And if we have time we might return through western Alberta via Banff and Jasper National Parks. The only "deadline" we have on our return to the Lower 48 states is my brother's wedding in Ohio in October. Barring an emergency, we're free to travel through Alaska and Canada until the end of September. Of course, any of this could change for any number of reasons! Stay tuned. Alaska is renowned for its grandeur -- spectacular mountain ranges, a hundred thousand glaciers, magnificent fjords that rival those in Scandinavia, immense expanses of untamed wilderness that are beyond the comprehension of most Americans. We can't wait to see some of that! I'm just getting started, and I haven't even begun to list any of the things we might see or do in Canada on the way up and back . . .
Like most Alaska visitors, I bet we'll have so many things left undone that we'll want to go back at least one more time. Hopefully we won't get the urge to move there! That's happened to quite a few people who fell in love with the place.